One of the largest postgraduate fellowships ever received by a Franklin & Marshall College student has been awarded to senior Sheldon Ruby. The government and history double major and Ann Barshinger, William H. Gray, Jr., and Russell Bleakley, Jr., Scholar from Everett, Pa., is one of just 30 students nationwide to be named a 2017 Charles B. Rangel International Affairs Fellow by the Ralph J. Bunche International Affairs Center at Howard University. 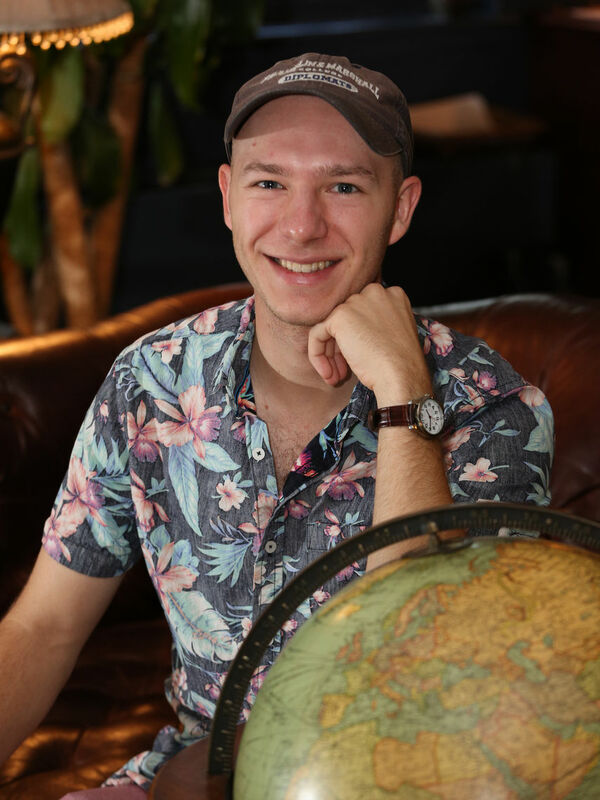 During the next two years, he will receive approximately $95,000 in tuition, fees and other benefits funded by the U.S. Department of State, and have the opportunity to represent the United States in an embassy-based internship overseas. Begun in 2003 and named for U.S. Rep. Charles B. "Charlie" Rangel of New York — currently the second-longest serving member of the House of Representatives and a founding member of the Congressional Black Caucus — the Rangel Program aims to enhance the excellence and diversity of the U.S. Foreign Service. Each year, it selects outstanding young people from around the country "interested in helping to shape a freer, more secure and prosperous world through formulating, representing, and implementing U.S. foreign policy" and supports them through graduate school and professional development activities that prepare them for careers in the U.S. diplomatic corps. "Sheldon's selection for a highly competitive Rangel Fellowship speaks to his talent, leadership, service and hard work at F&M. It's also a reminder of the power of giving high-achieving students from underrepresented backgrounds the opportunities they've earned at our leading colleges and universities," said President Daniel R. Porterfield, who first met Ruby in 2012 when he was a high school senior participating in the second year of the F&M College Prep program; Ruby was supported in his college search process by Stephanie Leiderman, a counselor in F&M's Pennsylvania College Advising Corps. "When we support F&M College Prep, and when we sustain a great learning environment for all students at F&M, Sheldon's growth and learning is precisely the kind of result we imagine," Porterfield said. "And so the entire F&M community celebrates this tremendous achievement with him." Ruby hopes to enroll in the Master of Science in Foreign Service program at Georgetown University next fall, looking to build on "the unique combination of experiences I had at home, abroad (as a Critical Language Scholar in Indonesia in 2015), and at F&M [that] have led me to seek out the nuances within and between cultures, as well as to treat people as individuals with their own particular history." Often seen leading F&M's campus tours for prospective students, Ruby serves his fellow students and the F&M community-at-large in many other ways. He is co-founder and co-chair of First Generation Diplomats, the College’s first student organization dedicated to the support and success of first-generation college students at F&M. He also serves as secretary of the John Marshall Pre-Law Honor Society and student representative on the Active Bystander Intervention Committee and Faculty Committee on Sexual Misconduct. He has also served as a member of Diplomatic Congress, as secretary and co-chair of philanthropy for Kappa Sigma Fraternity, and as one of five executive directors for Ware in the World, the community service and outreach program of Ware College House. "He is a force of nature," in the eyes of Assistant Professor of Government Nina Kollars. "Make no mistake," she added, "Sheldon didn't 'win' this fellowship, he earned it." Kollars' colleague, Associate Professor of Government Jennifer Kibbe, also recommended Ruby for the Rangel Fellowship after having him in her Understanding Terrorism class. "The course material often forces students to examine their pre-determined assumptions and what they think they 'know' about terrorism, which makes more than a few students uncomfortable, at least at first. What was fascinating about Sheldon was the degree to which he was okay with that discomfort. He understood it for what it was, didn’t get defensive about it, was eager to pursue the questions it raised for him, and was not afraid of the answers," said Kibbe, who finds Ruby "eternally curious, eager to take on new challenges, and able to establish a rapport with a variety of peers." "Those characteristics are what made him an outstanding Rangel candidate and what will make him a stellar foreign service officer!" said Kibbe. In addition to pursuing graduate degrees in international affairs or a related subject such as public administration, public policy, international relations, business administration, economics, history, political science, communications or foreign languages, Rangel Fellows participate in two internships. The first, working on international issues for members of Congress in Washington, D.C., occurs in the summer after being selected and before the first year of graduate study. The second, an overseas internship in a U. S. Embassy, takes place during the summer between the first and second years of graduate study.